“So I guess we are who we are for a lot of reasons. And maybe we’ll never know most of them. But even if we don’t have the power to choose where we come from, we can still choose where we go from there.” This quote by Charlie from the Perks of Being a Wallflower by Stephen Chbosky is a quote that pushes and inspires Nicole Weyer, daughter of Shawn and Sarah Weyer, daily. When she isn’t at school, Nicole loves to be outside going on nature walks with her dogs, sit by the fire in the back yard, and go camping. What makes her different from other people is that she likes to participate in very different activities like exploring a nature trail and shopping. The most influential person in her life has been Kaci Smith, her art teacher who has mentored her and directed her in the right path in order for her to be successful. Through Kaci and Nicole’s love for art, she has created a foundation for the rest of her career and goals. 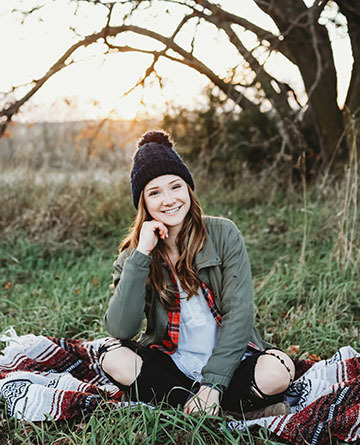 Nicole is planning to attend The University of Kansas to study Graphic Design and Visual Communications with a dream of being a designer for Hallmark. When she leaves Valley Heights, Nicole wants to be remembered for her art work. Nicole is using her love for art as her Senior Service Project by pairing up with Skyler Saunders to paint murals within the community. “I picked this project because I know it’s something I’m good at. It just seemed like the most logical way to give back to my community,” says Nicole Weyer.